Coming to your garden center soon: native clematis! Current research shows there is a lot of potential for these beautiful flowering vines. 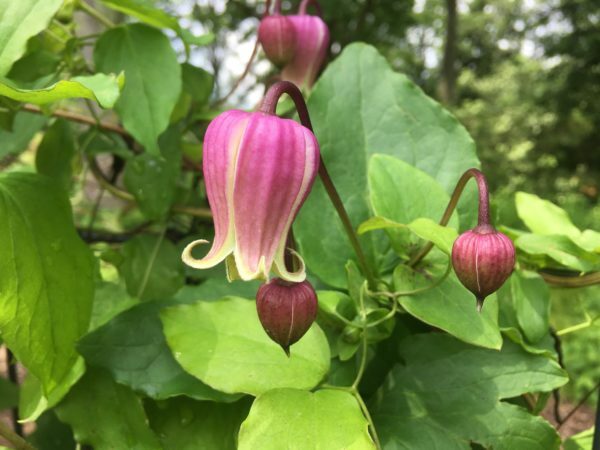 Dr. Dwayne Estes overviews the genus Clematis, presents the identifying characteristics of the American species, and discusses their ecological preferences, geographic distribution, and garden-worthy features. Amy Highland then leads a tour of Mt. Cuba Center's core collection of native clematis so you can see first-hand how amazing these plants are. Please bring a sketchbook and colored pencils to class. Rain date for this class is Friday, June 28, 2019. This class qualifies for the following professional credits: 2 APLD, 1 CNP credit with DNLA and 2 NOFA AOLCP. Two professional development hours (PDH) have been approved for this class through LA CES. This class meets LA CES standards for HSW subject matter.